Lately it seems as though I have been drawn to books and blog posts about people who are not "set in their ways" about Jesus and Christianity. Monday morning a friend of mine sent me the YouTube link about the "church of Oprah exposed." Combined with the "10 questions that every intelligent Christian must answer" video and the "God is imaginary" website, it is easy for me to see how people can have serious questions about what they believe about God and about Jesus. The dictionary definition for “compassion” is “Deep awareness of the suffering of another coupled with the wish to relieve it.” The word “rescue” comes to mind. Jesus so much wants to rescue people from the darkness. But if someone is so entrenched in darkness, light is a scary thing for them (The light shines in the darkness, but the darkness has not understood it – John 1:5). They fear what they do not understand; it is as though they are afraid of the one thing that can save them. They need someone to guide them toward the only source of salvation that they can trust: Jesus Christ. And in order to do that, we have to be willing to go into some dark caves sometimes. Why would someone do that? Why would someone go on a “rescue operation” that is outside of the comfort zone? To relieve the suffering of the one who is helpless. Something that I have heard various people who don't believe in God say goes something along the line of "Everything I (spiritually) need I can find within myself." That leaves me with a couple of questions. One is, what happens when life gets out of control and they can't fix it? And another is, what happens when they have a question about something greater than what they can find within themselves? Do they spiritually self-destruct, only to retreat into a dark cave, as far as they can, not realizing their state of helplessness? Jesus is the light of the world, the beacon that will guide them out of the cave. 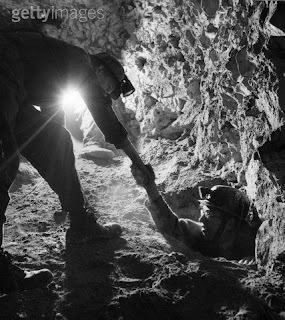 It is up to the "search and rescue team" to guide them to the light. I just watched the video again. At the beginning he assumes that the viewer (me) has a college degree and therefore is educated. I don't have a college degree (never finished), and according to his critical thinking skills I am therefore not intelligent and don't have the capacity of critical, rational thinking. But, even if I had completed my college degree, I'd say, "BRING ON THE DELUSIONS!"